I read a lot, some people would say too much, but I would say not enough. The books I am listing were discovered by reading other people's lists, hearing about it on radio or tv. or reading in a newspaper or magazine, a personal recommendation or sometimes even just wandering around the library. If any reader discovers something they end up reading (and enjoying) I feel the whole effort worthwhile. At least I took someone away from some tv. fluff. If not, I hope you move onto some other more inspiring list. 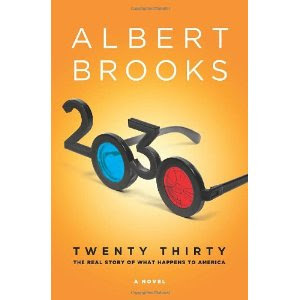 I mix up fiction and non fiction. I read non fiction as a sort of self improvement effort. Good fiction is very distracting for me. Many of the books listed have been a blog or a newsletter post. Roger Ebert, the film critic who I admire beyond his usually excellent reviews wrote "Life Itself". Often sophisticated consumer websites will tell you if you like this you'll probably like that. It is a good idea, but I also like to do it with real people. I am interested in your lists. Talk of the Oscars will soon be starting and like everyone else I have a few thoughts on what movies I think should be recognized. A few confessions right up front. I love foreign movies and probably have a bias. I don't go to many movies as they are released, waiting til the ones that look good are available through DVD. I have learned of many interesting movies from reading lists and hope that my list might help you select an enjoyable movie. I do see a lot of movies, (over 160 in 2011) most of which are screened through reviews (another bias, but I do think justified). I look at critics (eg Rotten Tomatoes), but also regular viewer (eg. IMDB). I can't escape that each of us has a different perspective and when deciding which movies to pursue you need to allow for the bias and prejudices of whoever is pontificating. The movies listed are all ones that I personally viewed in 2011, but were not necessarily made or shown in theatres. Top English speaking movies released in 2011 that I liked. "The King's Speech"--an unusual topic that illustrates how important some things we take for granted can be. "The Help"--hard not to laugh, hard not to appreciate the hypocrisy. other English language movies I liked in 2011, but released before. "Cell 211" from Spain was brutal, but very impressive. I enjoyed more Euoprean movies including a few French comedies, Danish films and a few more German. The best of the Bollywood lot for 2011 was "Zindagi Ni Milegi Dobara"--set mostly in Spain with a fair amount of English dialogue--really a road trip with three guys with a little romance and dramatic tension thrown in--very pleasant music, great acting, well put together Hrithik Roshan, Farhan Akhtar, Abhay Deol, Katrina Kaif and Kalki Koechlin. "Mod" was a fairly good movie released in 2011 that led me to checking out movies by Nagesh Kukunoor, a low budget director, writer and occasional actor. Better ones were "Aayshaein", "Iqbal", "Three Walls", and "Dor" which were all superb movies. I watched a few of his lesser ones. 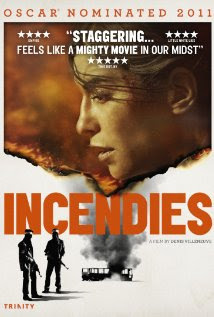 One of the most brutal movies and best done was Canadian, in French, "Incendies." It is very layered as you nudge closer and closer to a sickening conclusion. It points out the evilness of hatred. There are a lot of director/writers and actors that made viewing more pleasant. Amongst directors I would like to mention Paul Haggis, Nagesh Kukunoor, and Farhan Akhtar. Amongst actors would like to mention Colin Firth, Matt Damon, Russell Crowe, Aamir Khan, Shreyas Talpade, Romain Duris, and Nicholas Campbell. Audrey Toutou was priceless in "Priceless", very true, even if a bit opportunistic. Perhaps I missed a few of your favorites. Love to hear what they were. I will be looking for new selections. TRADE SHOWS: WHERE CUSTOMERS COME TO MEET YOU! If you have ever worked a booth you know it can be very tiring and boring. At some stage you wonder if you really needed to be there as there are other (maybe better) opportunities to generate income and certainly more enjoyable ways to spend your time. In fact trade shows are unique opportunities. Usually I am phoning people or occasionally visiting them. They are often busy and off guard. Many of them are really annoyed that I interrupted whatever they were doing and only wanted to sell them something that is pretty low on their priority list. At a trade show things are a little different. I am not interrupting them. Most of them are actually open to new ideas (or exploring old ideas). They are seeking information. In some cases they come quite a distance and there are always some I have been totally unaware of. Think clearly on what you hope to accomplish at the show. Strictly selling, developing relationships, keeping up with your competition, increasing awareness of your products or company, educating the public or something else. Note the theme of the show and fit into it. Contact your established customers and any contacts to find who is planning to attend. Encourage them to visit your booth. Creating traffic this way helps develop traffic from onlookers who are curious about the attention you are attracting. Planning for a trade show starts months ahead (even a full year). Selecting a show is a skill all by itself (more on that later). Once a show has been selected, mark it on your calendar and think of all the things you hope to accomplish. You will be limited in space, time and manpower. A check list is a must and you need to check that it is up to date. Scheduling your preparations will better ensure a successful show. Those involved in the show need to know what is expected of them well in advance. Strategies need to be agreed upon. If you are doing demonstrations they should be rehearsed. If you are giving out literature it needs to be made available and perhaps customized. Signage, furniture, carpeting, and any props need to be made available and familiarized with. Social media can spread awareness. To start off, link up to the show Facebook page and Twitter account. Find out if there is a hashtag and if not you could create one yourself. Let all your contacts know you are there, when and where. Keep up to date with social media developments. You will need energy. If you are by yourself you can be standing for hours, perhaps talking for hours (over the din of a crowd). You need to be concerned about comfort and where you may feel it first is your feet. Comfortable shoes and a padded floor make a big difference. Food is also an issue that you will find trade shows normally provide expensive, relatively unhealthy food. Bring your own with your energy needs in mind, but avoid eating in front of visitors. Bad breath can be a problem that starts with your choice of food, but can be remedied with paste and brush. If you are out of town dining after the show should be planned for. Be well rested. A solitary trade show exhibitor has a strong challenge, but needs to take a break. If you have more manpower at your disposal schedule the booth staff considering peak times, appointments and energy levels. A break can include scouting to see what others are doing, lunching with visitors or suppliers and perhaps developing alliances. Or for a short time tune out your environment. Booth design and location can be critical to success. Some elements of success include being well lit, having some motion in your booth, large photos. Do not barricade yourself in with tables. Location is something you may have little control over, but look for opportunities. It is sometimes possible to get a more desirable location if other exhibitors fail to show. The problem then becomes directing people to your new booth. Arrive early. Make sure your booth is ready. Scout around so you are familiar with such things as eating facilities, common meeting areas, show management office, washrooms and other exhibitors (competitors, possible allies and even potential customers). You can't talk to everybody, but everybody at the show is some sort of prospect. You will learn that most visitors don't want to hear a lengthy sales pitch. Many of your contacts may be compared to planting a seed that may take some time to grow. Others could be an instant boost to your business. Often you have only a very few seconds to get their attention. To avoid missing opportunities you should not sit down, you should minimize talking to booth staff or doing chores. Those walking by may not even notice you or think you are too busy to bother with. A simple question can work wonders. "What brings you to this show?" One that worked for me is "where are you from? " Do not go into a sales presentation before having an idea of what their motivations might be. "Do you have any concerns that we can help you with?" If any interest is expressed ask if they would like more information or a demonstration. Try to capture some contact information and awareness of relevant concerns. This can be done by holding draws or asking them to fill out a lead card. Offer your contact information. Engage them as much as you can within the limits of time and space. Shows seem to be famine or feast. Unavoidably visitors join other visitors in the midst of one of your presentations. Some people just like to avoid too direct a pitch while others are attracted to whatever is interesting to others. You have to bear in mind all parties, but the first visitor should be respected. You can let the other person join in, but you may have to repeat yourself. You can start from the beginning, but that could (or might not) irritate the first visitor. Or you can offer to repeat your presentation (or deal with other concerns) after finishing this one. Ideally your booth is manned with enough people to minimize this situation. Literature and samples are areas of concern. Show management get upset because visitors will often accept literature to be polite and then dump it when they get out of sight. Samples are sometimes mistaken for stolen items that security guards may question your recipients about. Both literature and samples are expense items and although there is truth in the value of numbers you should be selective. Offer to mail or email literature. Samples to me are an ideal opportunity to follow up so requesting contact information is appropriate. At some point it becomes important (for both of you) to disengage. You are there to engage with as many people as practical as they are to soak up information from as many exhibitors as practical. A simple question "is there anything else I can help you with at this time?'' Thank them for their time. You might point them to other booths of interest which might enhance you as a source of information. Respond during the show (not missing opportunities to meet new people) as much as possible. You can email from the show (or shortly after the show) an acknowledgement of their visit and commit to another contact as soon as practical after the show. If you are able to personalize or deal with specifics do so. Activities to generate more traffic might include dealing with other booths that are complementary. Use twitter or Facebook to announce special reasons to visit your booth. The old stand by of candies or nuts still has some value, but try to be unique. At one booth where we were selling an orange smelling cleaner we gave out orange candies that drew traffic and linked to what we were selling. Phones are very useful, but can be a danger. You do not want to be interrupted when talking to a visitor who might be very transient. If you are by yourself you should limit time to deal with incoming calls relying on voice mail as much as practical. If you check with your office during slow times you might head off problems coming from the outside. By all means use your phone to put out messages to those at the show. Don't forget the show's hashtag to reach a wider, but focused audience. Do an assessment as soon as possible while details are still fresh. You are looking for what needs to be done in the way of follow-ups, but also figuring out how you could have done better in preparation for future shows, particularly if you repeat this same show. This is an excellent time to update your checklist. The real evaluation of the show is an ongoing process. In my data base there are two areas where I am careful to record relevant details (in addition to all the standard contact information). Under every contact record I note the original (and sometimes supplementary) source which likely would include some new prospects met at the show. On the contact log I also have an abbreviation for the show including the date so I can later trace who I met at particular show. I also include people who I merely waved to as that can be part of a future conversation. "Sorry I didn't get a chance to talk to you. I hope you enjoyed the show." Such information makes following up easier and evaluation more meaningful. In some cases you made sales or had contracts signed at the show. For many of us, the sales are after the show and often take more effort to develop. If you are able to measure sales to specific clients it will provide an important measure. If not, perhaps you can relate the show to your overall sales. Go back to what you had hoped to accomplish. Can you measure any of that? Did you get a few benefits you had not expected? Every experience should be a growth experience. So your decision to go back to the show (or not) should factor in the results. You will also find talking to visitors and fellow booth holders that they recommend different shows and can often give you sound reasons. You are unique so do not get carried away with advice of those with a different agenda, but don't ignore them either. Traditionally trade shows are held in a slow part of the year, but your timing might be just a little different. The photo at the top going from left to right is Kelly Bowers, Barry Finn, publisher of The Rider and myself. Once again, I will be at the Can-Am All Breed Emporium at Western Fairgrounds in London Ontario on March 17th and 18th at booth I 8. The booth will look something similar to the one in the photo. My daughter, Heather has a habit of giving me mind opening books. "Unmarketing" is yet another example for which I am grateful. Scott Stratten is known as a social media expert. I think he has gone beyond that and has much to say to anyone who thinks they are engaged in selling. Engagement is the key. Marketing seems to me to be two things--numbers and refined numbers. Numbers is straight forward--whatever you do, do more of it to reach a bigger audience more often. Refined numbers is trying to categorize people and develop a pitch or presentation that is tailored for profitable niches. Oversimplified perhaps, but Scott has taken his experience with social media and put it back towards traditional marketing. For some people social media is just an extension of regular marketing where if you send out more messages and maybe fine-tune what you are saying and to whom, you will increase sales. Misses the point. Social media is an opportunity to engage prospects. Engaging essentially means a two way conversation that might not always directly deal with what you are trying to sell. Building relationships is really what you are trying to do. A key quote from Scott is "If you believe business is built on relationships, make building them your business." Always look for opportunities to engage. In many of his chapters he puts himself in the role of the potential buyer. As knowledgeable salespeople we often figure we know so much more about the product we are pushing, that other people are a bit dumb if they don't understand the opportunity we are offering them. At the same time in reality we try to avoid rejection and are reluctant to waste our time on obviously unlikely buyers. If you are always preaching you are turning away people who potentially have an interest in what you are selling or know someone who does. Every contact point is an opportunity to engage. His advice can apply to big companies or small start-ups. Asking your audience what you need to stop doing, what you should start doing and what you should continue doing will tell you what you need to think hard about. Trying to build a following can be demanding. Quantity and quality can make a difference. To start conversations you need to reply to other people's concerns, raise questions and be authentic. Some people find it is too demanding and resort to automatic tweeting where your tweets are spaced out. Scott feels if you aren't there to respond your audience will soon realize you are not authentic. Honesty is the best way to deal with this. It is ok to delegate to someone, but it is necessary that they be identifiable. He is very comfortable with a retail environment. A common occurence in retail outlets when approaching people looking around your store is "I'm just looking." Scott sees this as an opportunity to engage with minimal pressure. He suggests you hand out general interest sheets along the line of "10 things to look for when considering buying...." Have a newsletter that gives consumer tips that anyone can benefit from. He has some interesting things to say about trade shows. They too are opportunities to engage. Make your booth a welcoming place, one that will make passers-by not feel you have other things you would rather do. Every person going by is somehow connected to someone higher in the buying chain. Scott has some practical ideas how social media can be used to draw interested people to a show and also when at the show to attract traffic to your booth and engage your fellow exhibitors. One of the interesting possibilities is that some of the "strangers" visiting can turn out to be your social media acquaintances. Social media is not isolated from other efforts to promote your business, but can not only support your marketing, but can also help guide it. My little review does not really do justice to the book where you will find a strong underlying philosophy with lots of practical advice. Get the book by all means and check out his website; http://www.unmarketing.com/ On there you can get his current thoughts and follow him on social media. I grew up as a dog person. There always seemed to be a dog in the family. My father used to say to have a dog love you, you had to let it sleep in your bed. Well that certainly happened to me. Now forty years later I am a cat person and although I still like dogs, I have little desire to own one. A lot of things helped steer me this way, but as usual people are important. 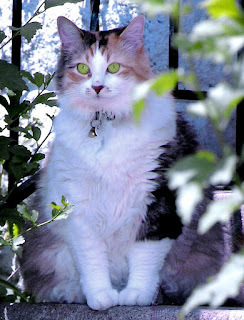 Growing up in Oshawa I remember one of my younger sisters, Susan picked up in succession two stray cats and kept them. I was sure my father (who seemed very intolerant of all sorts of things I wanted to do) would not allow this. Well he did. Perhaps he felt it would be good for Susan and not at all upsetting to him. I learned later that although he always had a dog he had "owned" cats as a young boy. For a brief time I lived with my sister Pat who had a Himalayan cat from her mother in law. Very cute, but not my cat and I didn't really get attached. Moving out into the world and not giving pets much thought I eventually owned a house. My sister-in-law Lorri decided a cat would be appropriate for her sister, my wife, Sharon. She even asked me if I was okay with it. I said "no.". She decided it was such a good idea she would go ahead anyway. At first I was very resistant. Even when I felt myself melting I put up a good front. After awhile I found myself becoming more and more attached and found it hard to resist petting our cat, Sheba. Eventually and I am not sure how many years went by Sheba became ill and a decision was made to put her down. Neither of us wanted to actually take her to a vet. A friend, Debbie Bulir agreed to help out and we gave her a key and the freedom to decide when. I was devastated. At the time I felt very guilty, after all men aren't supposed to get too emotional about a cat. I decided I did not want to go through that experience ever again. Ironically around this time I made sales calls on pet stores and veterinarian clinics. Constantly talking with people with an attachment to dogs, cats and other pets. I had trouble connecting with their emotions and their daily concerns. From my visits to vet clinics and developing a newsletter I became aware and then interested in grief counselling for pet owners. I realized I didn't need to feel guilty about my reaction after the death of my first cat. Cats can give you unconditional love (certainly don't worry about your ups and downs) and are very forgiving. At about the time my oldest daughter left to go to university in far away Halifax my sister-in-law Lorri decided it would be a good time to give us another cat, from one of her litters. She very considerately asked not only me, but also my son if it was ok. We actually both said "no", but this didn't deter Lorri. I didn't resist very long at all. A few years later when my son had left for York University, not so far away (but shortly took off to Victoria) a tiny kitten crawled up to our porch in the rain. I told my wife not to feed it, but I started to weaken as the kitten was very persistent. I felt guilty about leaving Molly home by herself while we both worked and no children for company. I talked to Mary Ditta at work who had a reputation for cats. I ended up suggesting the idea of taking in the stray. Our first stray soon named Maggie is now part of the household. Another woman at work, Natalie Warren explained that stray cats are often more affectionate probably because they are more grateful. It turned out the two cats don't get along. Their contrasting personalities are very interesting. Maggie wants to be friends, but Molly is very territorial and terrorizes her younger house mate whenever they get too close. Fortunately Maggie is much more spry. I have a lot of women to thank for my love of cats. Some say and I believe it pet owners live longer and are happier than non pet owners. Mind you cats want your attention at the most awkward times. One personality trait is their independence. They want attention a lot of the time, but they walk away when they feel they have had enough. Photos of my two cats. Molly is the good looking one (in a plump sense) and Maggie is the sleeker and more gentle one. The photo of a reprint of the horse and cat by Cathy Carter symbolizes my animal loves. The original painting was used in a campaign for Orange aPEEL, a company I worked for with a strong sense of mission. When I first saw it, I thought it was ridiculous and said so. But I actually had people call me and want to know where they could get a reprint. Taking a closer look I decided I liked it and at one time asked for it as a bonus and now hang in on my office wall right in front of my desk. I just had ten days off work with an opportunity to reflect on the past year and think how I might do better or be happier the next year. I did ponder a little, but actually feel more empowered now that we are a few days into 2012. Resolutions should not be too complicated, but another key thing is that the more people know your enthusiastic good intentions the more likely you are to follow through. I am over weight, poorly fit, and sleep poorly (from stress and too many other priorities). To get a handle on all that my intention is to get more exercise. Being too time and money stressed I have thought of only 3 ways--take one morning off (I work 2-3 evenings each week) and walk to the library and back (that is about 2 kilometres in total and there are extensions and alternatives plus I normally walk that route twice on weekends). Second when watching the news or DVD's get on the elliptical machine that has been put right beside my home desk, an hour plus per week would be helpful. Third, get more serious about doing pushups when I come in early to work--measure myself and build from there. I have been trying to get to 25 for a long time, but not every day. I will look for other ways to exercise, but need these 3 as a base. In general to get more out of life you have to manage your time. The exercise is intended to help relieve stress and to gain a feeling of accomplishment. Along the same line I wish to get more involved with meditation starting with mindful eating (I am a notorious fast eater who doesn't know when to stop). I remember a time in my life when I tried to cram in as much effort as I could to do a better job. At one time an employer commented that I didn't seem to take much of a breath between phone calls. Lately I have gotten a bit jaded and let rejections discourage me from making enough efforts. Although sales seem more difficult the old rule that the more honest calls you make the better the results is still very true. I have been simplifying my measuring calculations and have decided that only two measurements really count; the number of efforts I can make and the number of decision makers I contact in a two way contact. Other details are important, but if I can reach my goal here they will likely fall in place. My goal is to average 50 efforts per day and 15 decision makers per day. I don't expect anyone to understand the details, but will confess I have not achieved these goals very often in the last three years, but believe they are attainable and will make a difference. Preparing to make all those efforts and reach decision makers requires a lot of time sorting through many details. I have been getting bored and taking short cuts. Have to make a greater and smarter effort to make my contacts more effective. While I am trying to re-arrange my life to be more productive and get more enjoyment I will from time to time infringe on other people's priorities. I will make a greater effort to respect their concerns and hope that we can work towards mutual benefit. I am not ready for it, but retirement is both alluring and scary. I have some savings, but do not believe I could maintain reasonably close to my current living standard, especially with the frightening economy. I would like to build up a bigger cushion and for several years carry on some meaningful work which could be an extension of some things I have been doing. What would I do with extra time? Two things are attractive--one is to learn things (interesting, meaningful things) and to teach (one of the most satisfying things in my life was teaching my two children to read). I have been tweeting, blogging and doing a newsletter and realize there are a lot of you out there that I can learn from and that in some small way might learn from me. During the holidays I became a little more conscious of facebook (one special person brought me up to 10 friends, a motivating tipping point) and intend to use it to boost both my business and social awareness. One of the key things I hope to get out this is to at least keep my own resolutions. From time to time I will let you know how I am progressing perhaps at the bottom of some of my blogs and/or on facebook. Some of you can ask me in person if I am sticking to the program and the rest of you are welcome to question however you can. I have many interests and do not expect everyone to find every word I say worthy of much attention. I have found there is a reason for every interest and I am open to learning more about other people's interests so I can at least appreciate them better and perhaps expand my own interests. The photo above is of the most important people in my life, my wife Sharon and my children Heather and Michael. 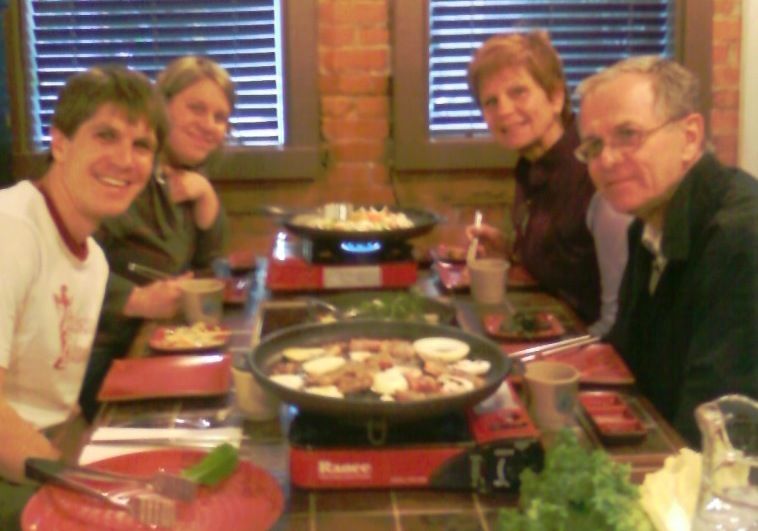 The occasion was when Michael was home from Korea and shared some of his experience with us--ordered in Korean and chose our meals--a new experience for me and much appreciated. There has always been a generational conflict, but as a boomer approaching the normal retirement age I am more conscious than ever that it is not always healthy for anyone. When I was just past puberty I wondered why I should have to do what my parents wanted, certainly resented any restrictions. A lot of harsh lessons were learned, but gradually I attained some independence. Like many I got a job, got married, got a house and had kids. Like my parents and grand parents going back forever my focus changed quite a bit as I took on more responsibility. I felt I needed to provide for, protect and guide my children. In all history we boomers are the first generation to depend on those younger for advice. We recognize that young people are much quicker to pick up new technologies. We would be lost without their co-operation. Balancing that is still wisdom that comes from life experiences gained over the years. Those in power do what they can to consolidate their power. The boomers are not all big power brokers, but some certainly are and all of us to some degree contribute to maintaining our generational control. Not to say that younger generations don't have any power, but really a lot of what affects them is decided by the boomers and traditionalists. My focus in this post is jobs. Jean Chretien once said there is "dignity" in a job. We are denying our youngsters this dignity and that will affect everyone. A job helps provide good habits, helps to give a sense of purpose and gives the necessary security to form families. Take that away and a lot of bad things start to happen that are difficult to reverse. A major part of the problem is the relentless pressures lessening work opportunities. One of the big ones is our increased efficiency through machines and technology. When I was in grade school this was predicted and was thought to be a good thing in that more of us would be able to enjoy life instead of feeling the drudgery of hard labour. Not quite working out that way for most of us. Our investments seem to be better off when we shift the cost of labour to cheaper markets. Those of us who have jobs want to keep them for financial security and a sense of purpose. Those of us concerned about retiring in comfort are much more apt to vote (and we already have the numbers on our side) to maintain pensions at high levels and to start at an early age. If money is tight we might accept cuts to education and child care and other "less important" things. Globalization is thought to be a good thing and to some degree we all enjoy the benefits. Communication with the far ends of the earth are quite easy and becoming more normal for more of us. Culture in the form of entertainment has spread and inter-mingled in all directions. Products (manufactured or agricultural) we find useful come from anywhere. For investors new markets are opened up, new resources made available. Unfortunately some have leveraged labour cost differentials to give themselves more profit and more power. Eventually there will be a leveling off of labour costs. Right now some people are grateful for the opportunity to work for a bicycle while others are finding it more difficult to work for our cars (and other symbols of previous high standards). Credit has been abused because we don't want to give up our lifestyle while others are encouraging us in this direction. At one time it was common for one breadwinner per family, then two became normal. When we still can't afford what we have become used to we borrow. It is time to take a long view. We are all humans wanting to enjoy life and have some sense of purpose. We can and mostly all want to add something to other people's lives. We have a different set of problems today. We also have new opportunities. Mostly I have more questions than answers, but we need to start the dialogue. To me job sharing in different forms is a key solution. Why should some people burn out while others live in despair? One obvious place to start is the required hours of work. Henry Ford was trying to figure out the best way to work his auto plants 24 hours a day. He had 2 nine hour shifts. By cutting the hours back to 8 he was able to have 3 shifts. Not only that, but he paid a higher wage than usual, so much so that many of his workers could afford to buy one of his products. They also bought other products from other manufacturers and other service providers and boosted growth everywhere. We over manufacture in that we can make more goods than there are people to buy and dispose of. We pollute and endanger our environment. Our natural greed is steering us to new problems. I will suggest some solutions, but they won't work without a change in attitude. To some degree all of us are concerned about accumulating big bank accounts and lots of consumer goods. I plead guilty, how about you? What kind of disaster will it take to change our attitudes about what is important? 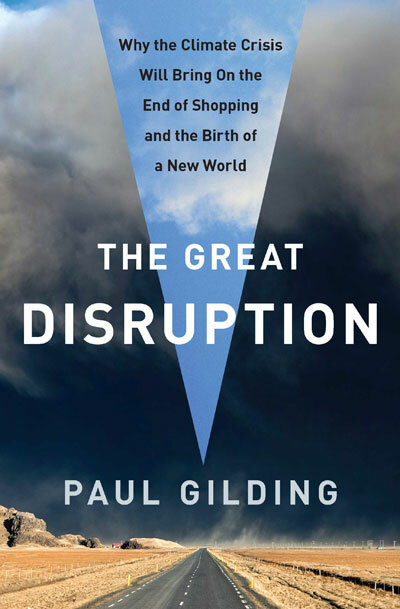 Natural disasters threaten and have been linked to consumer behaviour. Revolutions have recently occurred in parts of the world fueled in part by unemployed youths. On the positive side we do have resources not available even to our recent ancestors. We have technology to make work easier and we do have knowledge to change how it is distributed. Some people would argue very strongly to let the market solve this problem. I think that is very short sighted and self-serving. The market is in some ways just a collection of individual greedy desires with some people leveraging their resources at the expense of others. Leisure (especially that of others) is frowned upon as lazy. If you worked half the time what would you do with the spare hours. You could spend them enjoying life and part of that using services provided by people that might otherwise be unemployed. This has already been happening, but has run out of steam. To me one of the foundations of modern civilization is education. 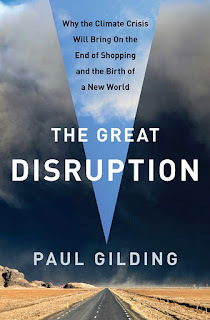 For much of our human history it has been limited to the rich or connected. Literacy has improved society for all people. A key thing is that education is most effective in small groups, sometimes that means one on one. Not everyone has the temperament or skills to be a teacher, but this is an area that can be expanded. By education I don't mean just learning the basic reading and math and productive activities, but also to understand and enjoy life more, for instance the arts, human relations skills, recreation. Leisure, instead of being a dirty word can be a goal for all of us. Job education is still important, but a lot of it has been wasted in the past. The Minister of Labour really might be labelled Minister of Human Resources and his or her main task is to help match up needs with talents. Obviously need to work with the Minister of Education. In my observation too many people are chasing after the big money, but it is often the big money of yesterday. The environment needs much greater care. We need to find ways to make energy more environmentally efficient and ways to stop pollution. There are jobs that can help ensure our survival. Where is the money for all this and what about the restrictive regulations that upset some people? Taking restrictive regulations first, and admitting they are not all beneficial, they do provide jobs and they can provide security for all of us. The money is a touchy issue, but the problem boils down to it seems to accumulate in relatively few hands. Those relatively few hands will have to decide what benefits them the most. Does it make sense for them to have another lump of money in the bank and have to build a security system to protect it and watch the world deteriorate around them; or is it better to live in an enriched civilized world where people can afford to buy whatever it is they sell. If they decide that the lump of money is more important then I believe all of us are destined to live in relative misery until violence replaces the power of money or we go the way of dinosaurs. A truly civilized world is a more pleasant place to live in (and might survive longer) for rich and poor, for young and old. A lot of problems to sort through, but I think it is time for the dialogue to move forward a little faster. The baby boomers can cling to their status quo or they can be crusaders for a better future for their offspring. The photo is just meant to symbolize people enjoying nature.